We went back to Boom Boom at the Myer Centre because it happened to be convenient, and this time I got the Western Style Steak dish. As you can see (or if not, I'll describe it), it came on a sizzling hot plate like the chicken dish from last time, topped with some sort of gravy and decorated with fried onions - paired up with baked beans. (An Australian classic?) 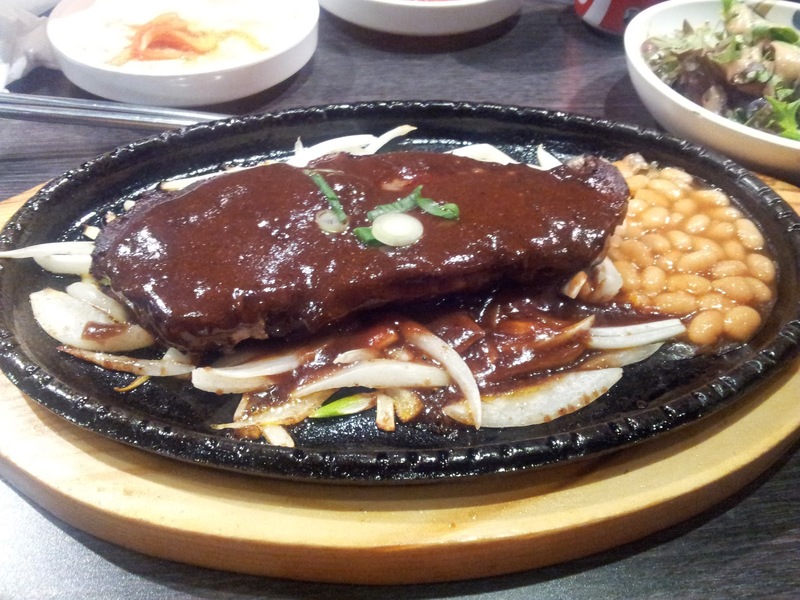 The steak itself was tender and seemed to be a decent cut without much superfluous fat or gristle. The onions weren't cooked as much as if they'd been barbecued - only lightly browned. That seems to be common in Asian cooking that I've found. Still, at least the onion wasn't raw, so I was able to tolerate that much onion in the one meal. The baked beans were just that, I'd be surprised if they even made them in store - and honestly, why should they, they're a Korean restaurant not a Western cafe. 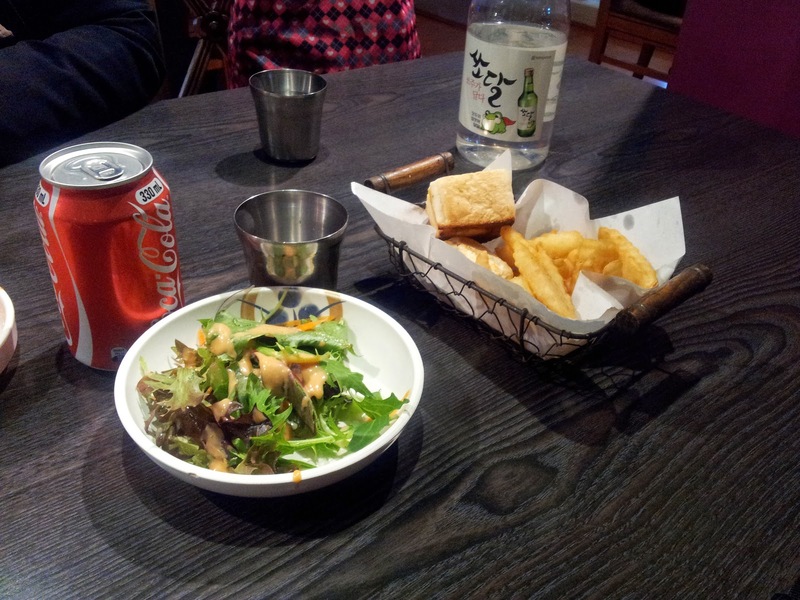 The salad , chips, bread, and Coke that the meal came with is exactly the same as last time, as you'd expect so I'll just refer you to the previous blog! Without the unusual amount of cheese and chicken in the one dish as the previous time (having just a medium sized steak), I was able to leave without feeling sick as if I over-ate. 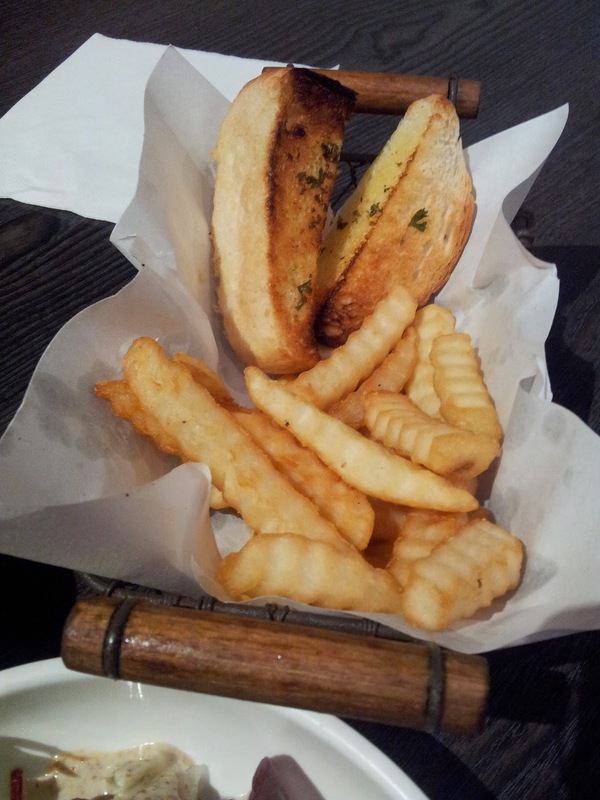 The steak itself was good enough, and the salad was nice, though they still need to improve their chips and bread. Of course... they are a Korean restaurant not a steak house where you'd expect good chips. 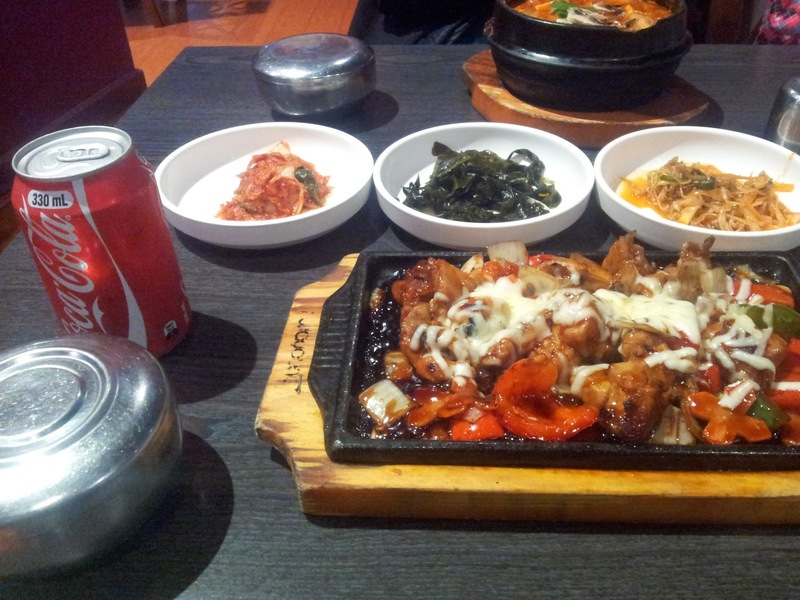 We went to the Korean casual dining restaurant in Brisbane's Myer Centre, Boom Boom. Next to the cinema complex and a video game arcade, this restaurant caters to a young and "hip" audience with posters of the Korean spirit alcohol soju, featuring attractive models and the day's specials on the walls in brightly coloured chalk or paint. 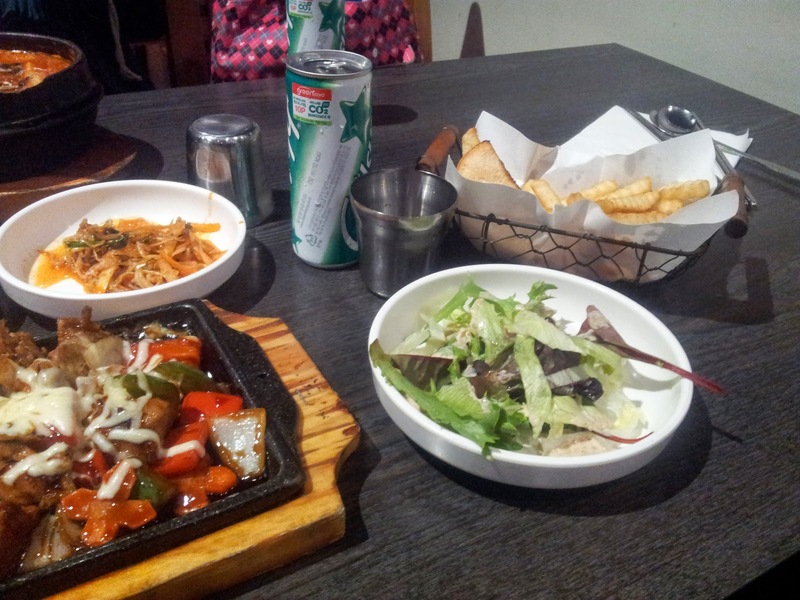 They had a special menu with "Western styled" meals for $20 including chips, salad, a soft drink and the main meal. I got a Cheese Chicken Teriyaki meal. 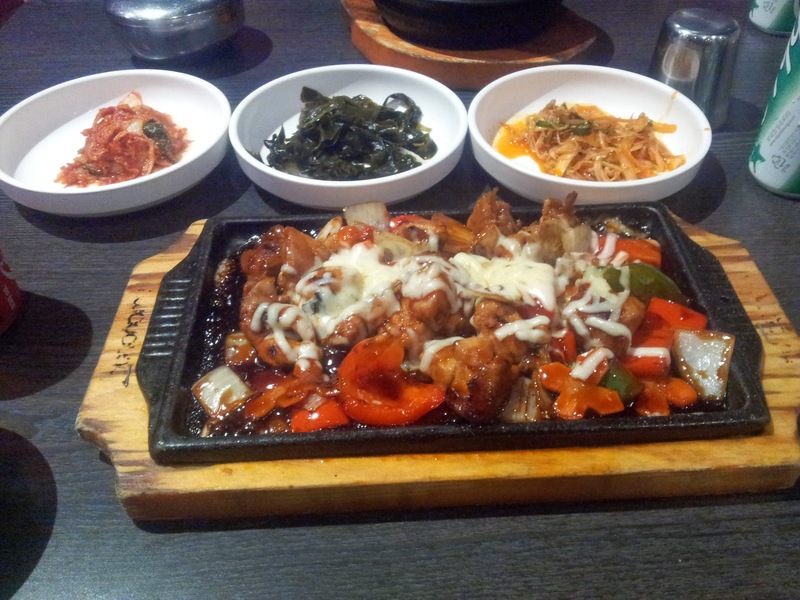 It was a stir-fry meal with vegetables and chicken served on a sizzling hot plate. 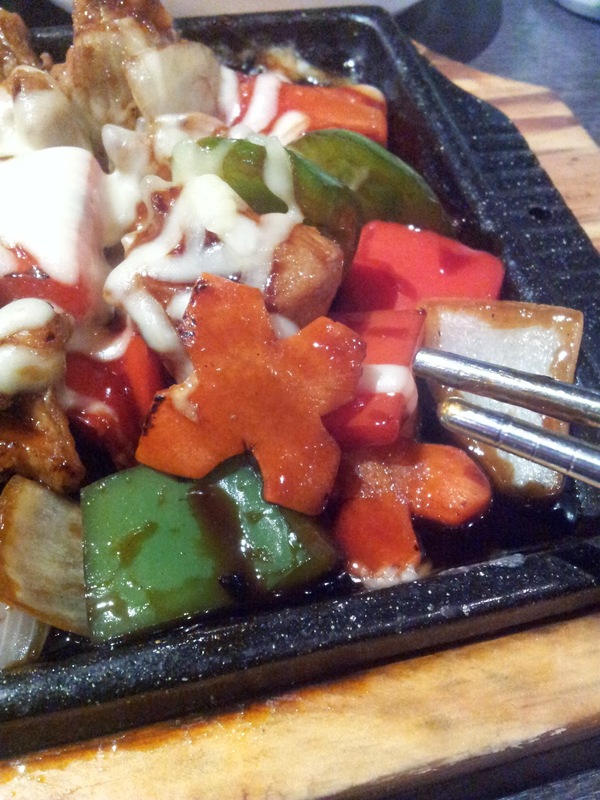 Cutely, they shaped the carrot into a little X. For some reason they gave everyone in the restaurant a free can of Chil Sung Cider, a popular Korean soft drink similar to lemonade. (I kept the can of Coke for later since I didn't want to drink too much soft drink in the one day since it's not healthy.) Like many Korean restaurants, side dishes (Banchan or 반찬) were included to share - kimchi, a Korean pickled seaweed dish (counts as a vegetable! ), and I think corn pasta. The bread crusty rolls with garlic butter nice enough - indeed crunchy and salted, but a little dry. The chips on the other hand were pretty bland, without much flavor and missing that nice crunch you'd want. But that was just an extra for the Westerners. The actual stir-fry meal was nice, the vegetables were cooked well and there wasn't too much sauce compared to the meal. The chicken and cheese went well together but of course by the end of the meal it become quite rich and sickly. I suppose if I had a larger appetite that wouldn't be a problem. The salad was simple enough, just lettuce and some sort of mayonnaise all chopped up into bits small enough to eat with chopsticks. The dinner was nice enough for the price, it would be good for a dinner with friends before or after a movie or a few drinks with food.